In Ada, a girl from the wrong side of the tracks weds a governor and helps him stand up to the corrupt state officials who seek to control him and his leadership. I have to say, I was very pleasantly surprised by Ada. I tend to think of Dean Martin as either doing comedy, romance or a combination. Here, he’s doing an entirely straight role. And, he does it extremely well. He plays the part of a young man, running for governor. He’s not motivated and is easily pushed into it by a “kingmaker” politician. And his life changes with a chance meeting with a lovely young woman. 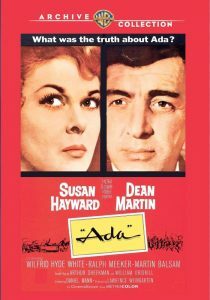 She’s the Ada of the title, played incredibly well by Susan Hayward. A young woman, who sells her body to men. And Dean’s character first likes her, then beds her. Then, he begins falling in love with her. And marries her toward the end of his campaign. Which the kingmaker doesn’t like at all. The kingmaker is Wilfred Hyde-White – doing an absolutely incredible job as the power behind the throne. A man who has set Dean up, so he can manipulate him like a puppet. An outwardly kind, genial, old man. He doesn’t hesitate for a moment to smear the opponent’s wife in the campaign. And when that leads to her suicide … he shows no remorse. And when Susan encourages Dean to become the Governor in deed as well as in name … A car bomb nearly ends his life. And Susan becomes acting governor. Dean’s character mistakenly thinks that Susan’s behind it, and she’ll be the yes-man for Hyde-White. He’s wrong. She plans to run her own rebellion, just in a different way. And it leads to an excellent conclusion. Susan Hayward and Dean Martin throw a wrench into Wilfred Hyde-White’s political machine in this Depression-era tale of corruption and power. Plucked out of obscurity by crooked party boss Sylvester Marin (Hyde-White), good ol’ country boy Bo Gillis (Martin) is elected governor based solely on smear tactics. Married to Ada (Hayward), an ambitious call girl he met during the campaign, Bo soon discovers he’s only a puppet with Marin pulling the stings. ﻿ So when Ada convinces her husband to stand up and fight back, it leads to car bombings and blackmail as Marin battles the Gillis’ for control of the state. Based on Wirt Williams’ Pulitzer Prize-nominated novel, Ada was partially inspired by Jimmie Davis, the singing governor of Louisiana, whose campaign song “You Are My Sunshine” is echoed by “May the Lord Bless You Real Good,” a tune written especially for the film and performed by Martin.